This article from Cleanipedia talks about a great way to remove mud tracks from your carpeting. Spring is here, and that means the ground is thawing, which also means that you might be tracking mud around a bit more than usual. The first thing you need to do is forget everything you thought you knew about stain removal. We’re always told to tackle stains right away before they have a chance to soak into the fibers and become more difficult to remove. However, for muddy footprints, you actually want the mud to dry. If you try to clean wet mud, you’ll find that it spreads and dirties even more of your floor. By allowing it to dry, you prevent spreading the stain. Once the mud is completely dry (you can speed up the process by placing a portable fan in front of the area), you can start to remove the mud. The best way to do this is by using a vacuum cleaner, preferably with the hose attachment so you can really focus on the muddy area. Don’t rush this – move the hose around slowly so you can be sure you’re picking up as much dirt as possible. 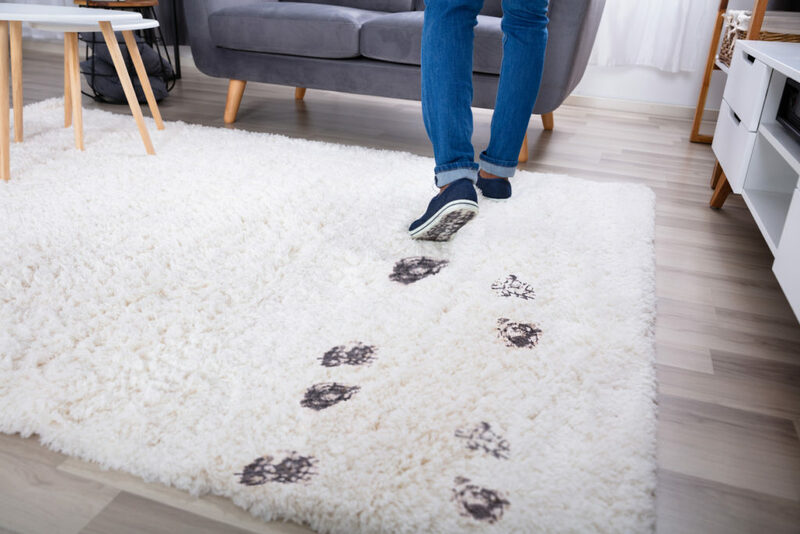 Some bits of soil will probably still be stuck to the fibers of your carpet after vacuuming, so you’ll need to scrape away the mud to loosen it. To do this, use an object such as a spoon and gently scrape the carpet, being careful not to cause any damage. Once you’ve loosened more soil, vacuum once more. Continue scraping and vacuuming until all of the dried mud has been removed. If you have light colored carpets, a small amount of discoloration may remain. Fortunately, this is very easy to remove by using a mixture of warm water and laundry detergent – preferably one with a built-in stain remover. Make sure to test any product in a small area first. If using powdered detergent, mix the solution well to ensure all the grains has dissolved. Dip a sponge into the soapy water, and gently dab the area until the stain has faded. Allow to dry naturally. If all else fails, please contact us at J and R’s Carpet Cleaning so we can assist you in removing any mud stains and clean your carpets professionally.